3 Bedroom Semi Detached House For Sale in Godalming, Surrey for Guide Price £700,000. 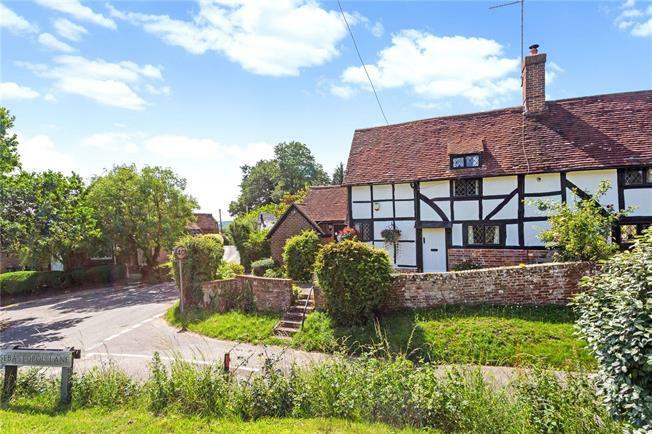 A beautifully presented period home of charm, character and history set in wonderful south and west facing cottage gardens. Formerly a smoke stack house with origins reputedly as far back as 450 years, the property has evolved and grown over its history into a comfortable three bedroom home with a real sense of warmth and personality. Exposed beams, open fires and architectural interest is evident throughout, particularly in the main living room, and is matched by a stylish and recently custom-built kitchen with adjacent utility room. Also on the ground floor is a second reception room currently used as a study and could be used as an occasional viewing. Upstairs and located off the beautifully light landing thanks to a roof atrium are three bedrooms and a modern bathroom. Sandhills is a tiny Hamlet with National Trust commons, on the southern slopes of the ridge between Brook and Witley. A short walk of Witley mainline station (0.2 miles) with a fast service to London in approximately 55 minutes, the area is rural in character. There are a number of local schools including King Edwards within very easy reach. Godalming is approximately 4 miles away as is Haslemere. There is access onto the A3 at nearby Milford, feeding to London, Heathrow and Gatwick, as well as the newly opened Hindhead tunnel making a fast journey to the South Coast. The gardens are a wonderful feature, surrounding three sides of the property and incorporating off road driveway parking. Landscaped and beautifully maintained there are several lawned areas, water features and vegetable gardens in addition to mature shrub beds and borders as well as a large expanse of paved terrace across the back of the house enjoying the best of the midday and afternoon sun. Of particular note is the unique and custom-built outbuilding, finished to a high standard with power and light, incorporating a garden store, workshop and studio with wood burning stove.